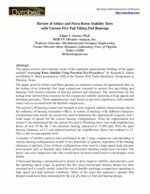 This paper reviews and evaluates some of the important experimental findings of the paper entitled “Assessing Rotor Stability Using Practical Test Procedures” by Kenneth E. Atkins and Robert X. Perez presented in 1992 at the Twenty-First Turbo Machinery Symposium in Houston, Texas. The paper given by Atkins and Perez presents an extensive amount of experimental data on the testing of an industrial five stage compressor mounted in narrow five pad tilting pad bearings with various amounts of bearing preload and clearance. The motivations for the testing were derived from concerns for the compressor stability operating at high speeds and discharge pressures. These apprehensions were based on previous experiences with unstable rotors such as occurred with the Kaybob compressors. The narrow L/D bearings tested were thought to have superior stability characteristics due to the influence of bearing asymmetry effects. A variety of bearings with different clearances and preloads were tested. An exciter was used to determine the experimental response over a wide range of speeds for the various bearing configurations. From the experimental test results it was determined that the narrow five pad L/D bearing had a very high amplification factor of over 38 for the 5 mil clearance bearing measured at 11,000 rpm. With the open bearing clearance of 8.5 and reduced preload, the amplification factor was reduced to 25. This is still an unacceptable level. A number of stability analysis were performed on the 5 stage compressor corresponding to various bearing configurations tested. It was found that in general, regardless of the bearing clearance or preload, if any of these configurations were used in a high-speed, high pressure environment such as Kaybob, then violent self-excited whirling would have occurred. The heavy seal and compressor rubs that would have incurred would lead to catastrophic rotor failure. A three pad bearing is presented and is shown to have superior stability characteristics over the operating speed range. In general, the five shoe load-on-pad bearing design has been overused and is usually poorly suited for use in flexible mutistage compressors operating at high speed and high pressure conditions. Many of the cases that required a squeeze film damper could have been eliminated by the use of a three or four pad bearing design.